Sprout tops have long been a winter favourite, but as far as new vegetables go flower sprouts are quite intriguing. According to a website dedicated entirely to the flower sprout, Tozers the seed company spent some 15 years developing them as a more subtle alternative to the Brussel sprout. They certainly grow like a sprout, attached to a main central stem, but their little purpley-green shaggy leaves are more akin to curly kale. Health wise flower sprouts they class as a superfood (both kale and sprouts are superfoods) and are jam-packed with vitamins and iron. Even Marks and Spencer got in on the act when they launched a year or so ago claiming that they would be stocking them. Market garden manager Paul started growing them this year for the first time and I have watched their development with interest. The tiny fluffy buds have now turned into delicate deep purple flowers pretty much the same size as a sprout and they are just right for picking. I thought it was time to give them a try so I dropped in at Moelyci to collect a bag with a yummy weekend lunch in mind. Saturday was the first clear day we’d had in a while, no supper club, no rain and no other plans so it was perfect for getting on with clearing the veg plots and doing a bit of pruning and weeding. With the excess of Christmas still fresh I’ve been craving salads and fruit, but with some fresh air in the lungs I’d worked up an appetite for more than a few leaves, so in the kitchen I went to rustle up something with a little more oomph. For me hot salads are the perfect solution to my salad craving during the chilly winter months and so I came up with this. To my little bag of sprout flowers I added a good helping of sprout tops from my vegetable box, some crisp fried (Moelyci) pork belly and a good handful of croutons to keep up my trength for working out in the cold. 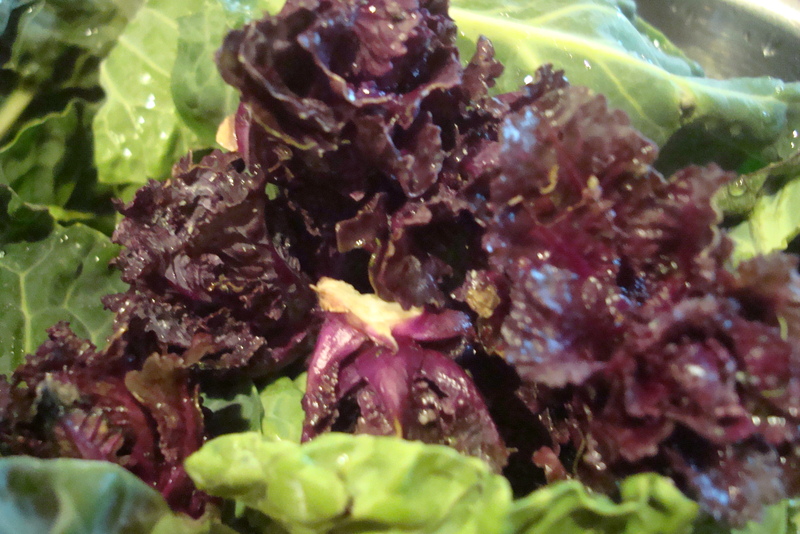 An earthy mustard dressing with a drop of truffle oil finished the dish. 150 – 200g good bread, cubed and made into croutons. For the dressing I used: 2 tablespoons white wine vinegar, a teaspoon of whole grain English mustard (but Dijon is good too), 1 tablespoon olive oil, 1 tablespoon ground nut oil, half a dessertspoonful white truffle oil (omit if you don’t have this) half a teaspoon honey and seasoning. Put a large pan of water on to boil. Chop pork belly into cubes and put a frying pan on to heat. You don’t need any extra oil to cook the pork belly as it is already quite fatty and will cook in the fat released. Make the dressing mixing all the ingredients in a screw top jar and giving a good shake. Don’t forget to taste it for seasoning and balance. If it’s too acidic add a tablespoon more of olive oil. Once the water comes to the boil add the sprout tops to blanch. Bring the water back to the boil for thirty seconds to a minute and then add the sprout flowers. They are more delicate so blanch quicker. Leave for a minute, but make sure the sprout leaves remain bright green and the flowers keep their purplish colour. Drain and plunge into a bowl of cold water to stop the cooking process. Put another pan of water on to boil or save the first lot of water and keep hot. Once the pork belly starts to crisp remove from the pan and put to one side. If there is a lot of fat in the pan drain most of it off. Toss in the cubed bread and fry over a highish heat until they start to turn golden. If you prefer you can make your croutons by coating in the remaining fat and then cooking in the oven for 20 minutes (gas mark two, 150 degrees C, 300 F) until crisp and golden. Towards the end of the cooking time throw in a handful of pumpkin seeds and the finely chopped red onion. The idea is that they are just lightly warmed and not cooked until crisp. When you are ready to assemble the salad, plunge the leaves into boiling water just to reheat and then drain well. Return to the hot pan and toss over a low the heat to dry slightly. Pour over the dressing. Return pork to the pan and toss everything together so it is hot. 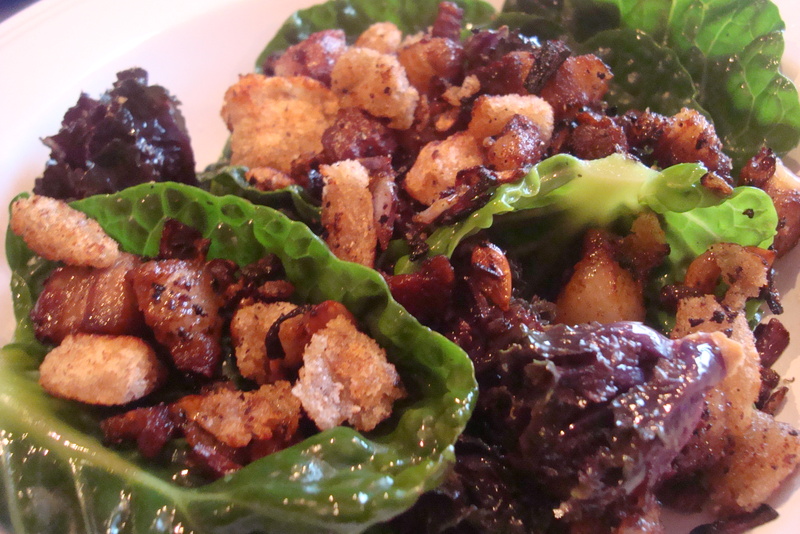 Pile the dressed leaves in warm bowls or on to plates and scatter over the pork and crouton mix.